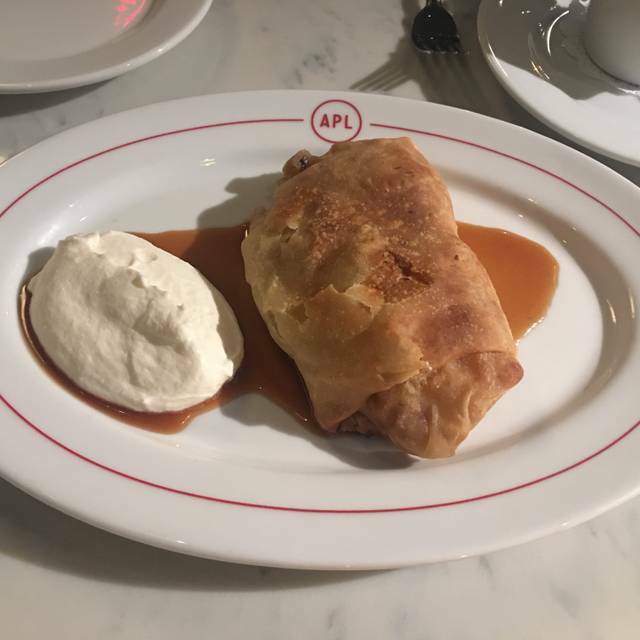 You must make reservations at least 5 minutes in advance of the time at APL Restaurant. Valet is available at $14 for the first 4 hours. $18 for over 4 hours. Attended lots are also available adjacent to Hollywood and Vine. 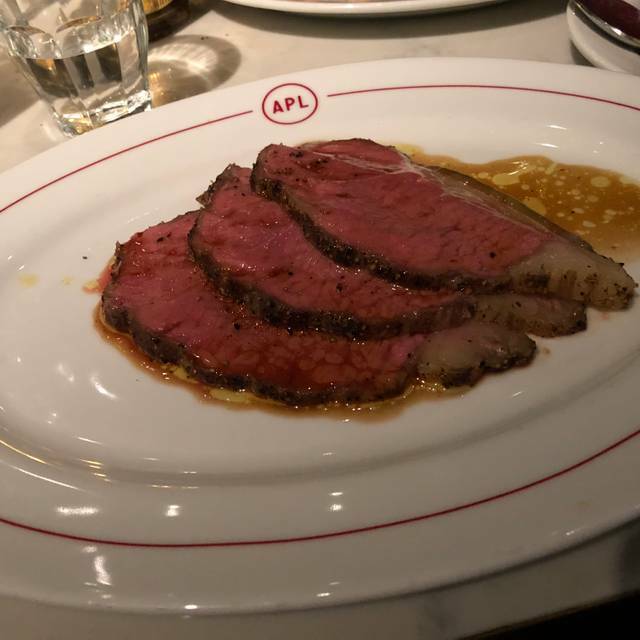 Chef Adam Perry Lang’s latest venture – APL Restaurant – aims to elevate the contemporary steakhouse with inspiration from the late 1800’s and early 1900’s. 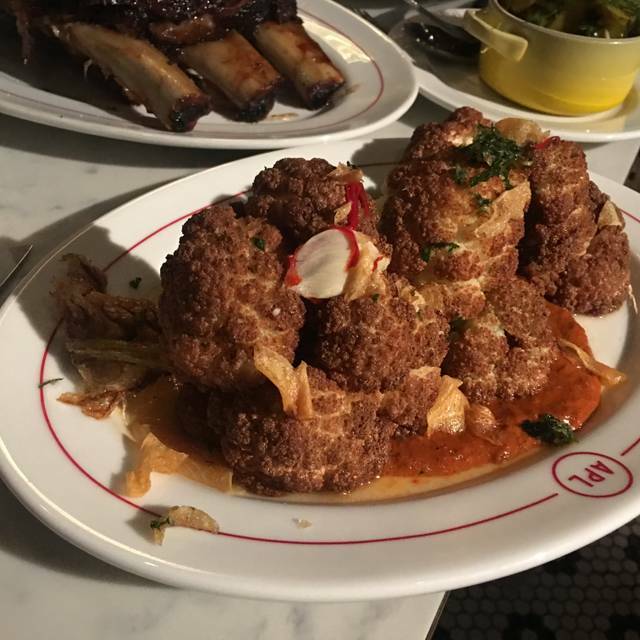 The 143-seat restaurant is situated on the ground floor of L.A.’s first-ever high-rise, the Taft Building, built in 1923 on the corner of Hollywood and Vine. Wanted to love it, but didn't. The appetizers were great, especially the beef tartare. I ordered the 100+ day tomahawk for one which turned out to be the worst piece of steak I've ever had. I was so tough, I couldn't cut it with a knife or even stick a fork into it. While the fillet they replaced it to was good, it was nothing special. Very disappointing for a place that's supposed to be all about the meat. Everything was delicious especially the spaghetti and wedge salad with that wonderful bacon. Waiters were excellent the food was great, what more can one ask for. My car was valet parked, the price was reasonable and when the show was over, the car was ready for me. Steak, burger, duck fat fries, custard for dessert, Jimlet cocktail, Brianna our server- all phenomenal. It was "okay". Wouldn't go back and wouldn't recommend. The Tomahawk was mediocre. The salads were very good. For the high prices and all the hype we were expecting better. It was great, I bit more on the portions would be great. Apps was kinda slim but the steak was fire! Crabcake was something out of a fairytale. I’ll be back again. Service was great. Steaks were not hot and fries soggy. Delicious! A bit pricey, though. Very convenient to Pantages Theater. After reading some of the other reviews, I am compelled to post my own regarding our recent first visit to APL. Our server was Brianna....she was fantastic. Attentive, patient and professional. 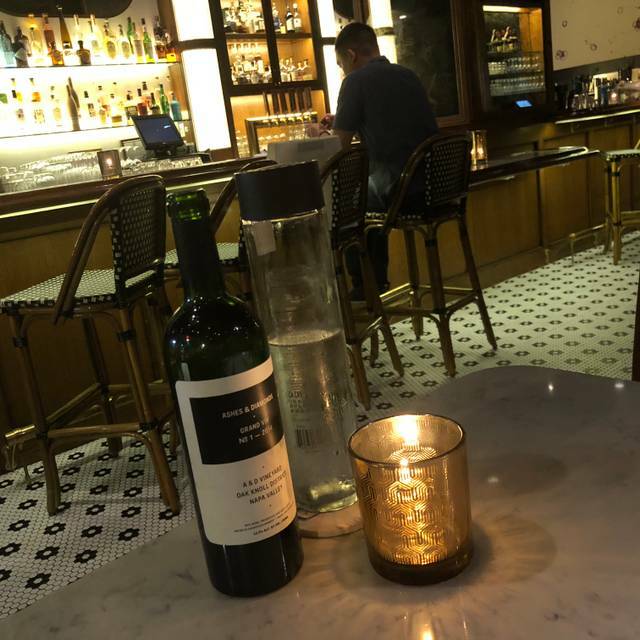 Restaurant has a nice vibe and ambiance. While food was a bit on the pricey side, everything we had was of excellent quality and well prepared. The Dry Aged Ribeye was perfect. The Spaghetti with Bianco Napoli Tomatoes was tasty. The Prosciutto and Burrata and Gjusta Bread to start were very enjoyable. We will return to try some of the other menu items. I was a little apprehensive at first as this restaurant is in the heart of Hollywood, which can be very touristy. We loved the decor and I had a pork chop that I will remember for the rest of my life! It was amazing. I have only one note to give this restaurant and that is that the music selection did not do the rest of the experience justice. In my humble opinion, the space and the lighting called for Chet Baker, Ella Fitzgerald or any of the jazz greats. Instead, on the particular Saturday we were there, the music was pure pop and just a little too loud. Having said that, you better believe I am counting the days until I can have that pork chop again! I was looking forward to trying this restaurant so much! It's beautiful and everyone was nice. Our side of mashed potatoes was cold and my Rib Eye stake was difficult to eat because of the gristle. That was a big deal. However, my daughter loved her chicken, my Nephew loved his spaghetti and we all loved the Broccolinie - I am still thinking about the sauce on that. Not a bad steakhouse, however it’s marketed as a great steakhouse, which it is not. It’s OK, but overpriced. Meh. You can a lot better for less. We had a great time, my filet was a little over cooked and because we were going to a Show I did not have time to send it back. It happens, but I would definitely go back and give them a second chance because the service was great. I am sure if I would have complained they would have been happy to fix the issue. Overall my Wife and I had a great time. Great restaurant! I enjoyed a wonderful steak (the filet), the bacon, and I must say the Maple Hog cocktail with Uncle Nearest whiskey was great. Steak over cooked, returned, over cooked again. The service is young and well intended, but poorly managed. Poorly puts it mildly. Very overpriced for the quality of food. The burger was very average at best and for $18 and having to pay for sides as extra, it seemed ridiculous when there are so many amazing, high quality burgers in LA with much better value. 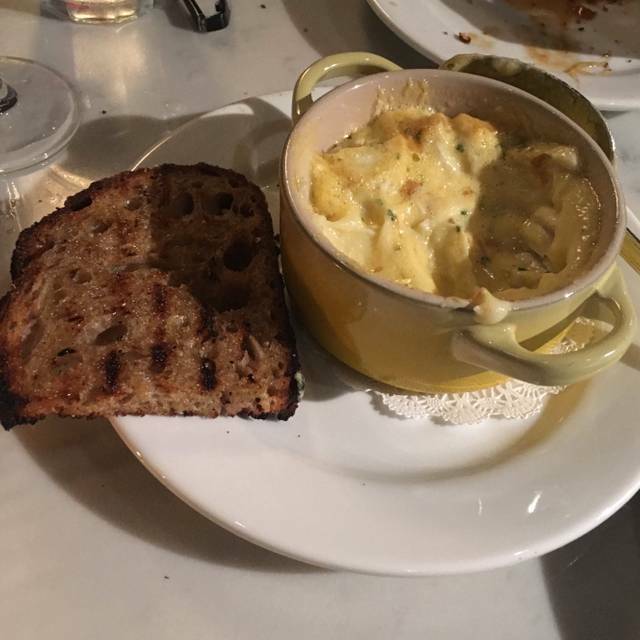 Our entire party was disappointed the French onion soup was not on the menu. And the short rib sold out in 1.5 hours. Ian was a great server and what we did order was delicious!!! Wedge salad with bacon and the brussel sprouts will not disappoint and is a full meal! 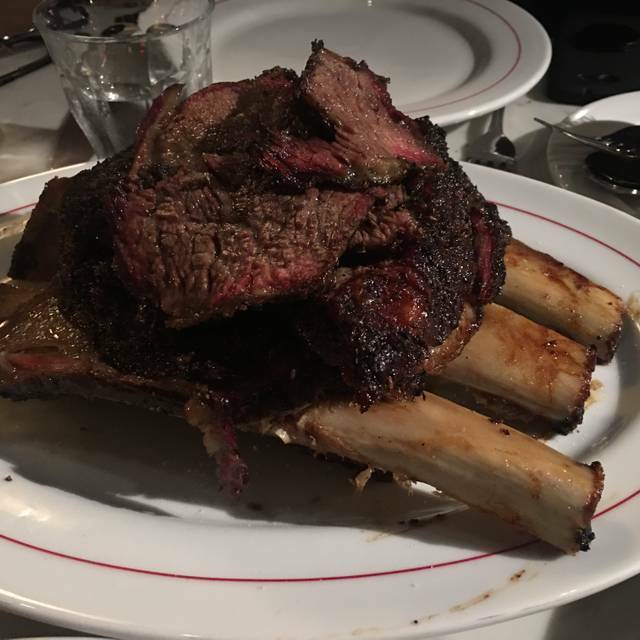 A smidge pricey to other steakhouse bistros (Wolfgang's, Palm, Morton's), but delicious and you pay for the aging of the prime meat. Only mild complaint was a little too much salt across the board. The Duck Fat fries were too salty for some at our table to eat. I thought they went great with my aged ribeye which was the envy of the table. All and all exceptional quality and service, just a little too much salt. The food,staff and drinks were all outstanding!!!! The prime rib was fifty percent fat. The mashed potatoes were akin to potato milk. The service was a mix of juvenile and pretentious. We had looked forward to this meal, but it was an enormous disappointment. Wanted to love this place after all the hype but our experience was underwhelming at best. I am pretty experienced in fine dining steak houses throughout the U.S. and expect higher pricing for unique dining, great service and high quality food. This experience mostly delivered just the high pricing. Cocktails were unique and presented well. Our party enjoyed the Figs blood and Maple Hog. Appetizers were mixed bag. One small crab cake for $21? Bacon tasted great but expected a thicker cut based on other prime steakhouse visits. Wedge salad was huge and a great presentation with a bacon slice. Probably best overall item we had. They were out of the signature short rib dish at 6:30 on a Saturday. Didn’t seem that busy. Steaks were just ok. Overall small for price and not nearly as tender as other steak restaurants with normal dry aged steaks(28-45 days). Filet, dry aged ribeye and tomahawk.Not sure if we actually had the Felony Knife? simple stamped steel knives with a sharp edge? Sides arrived late, seemed very small and pedestrian. Brussels sprouts looked and tasted like they were just dropped into a deep fryer. Don’t see a need to go back with so many other great steak options in town. This restaurant is absolutely amazing. The wedge salad was not only the largest I have ever seen, but it was the best. The rib eye was tender and flavorful. The chef came out and greeted us, which was really nice. I have already recommended it to my friends. Dinner before show at the Pantages. Food and service was great. Great place for food or cocktails before the Pantages. Just a 3 min walk from Pantages. Was not impressed. 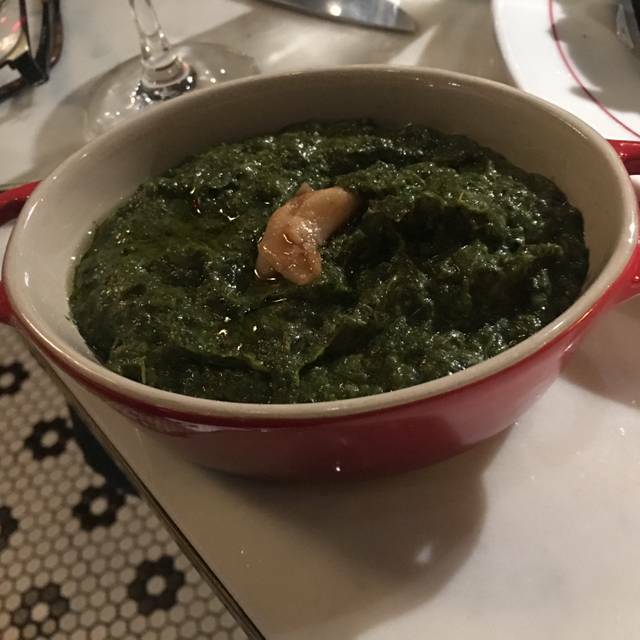 Thought short rib was overpriced and nothing special. Bone marrow was an abomination. Very mediocre steaks for the very high price. Poor service - we had to flag down our waiter several times. If you’re spending this much on steaks, go to Cut instead. Our first time here. Ian was our waiter and took great care of us. Food was delicious. NY Strip for me and Short Rib Steak for my wife. Both cooked to perfection. Brussels sprouts and crispy potatoes for sides. Definitely will be returning. If you love dry aged steak, this is THE place for you, hands down. Incredible flavor and they know what rare steak means. Great food and service. Didn’t like not being asked for the option to have regular ice water. Shouldn’t assume the table wants to pay for bottled water. Delicious from start to end! I dine at lots of restaurants in LA and NYC at all price points. 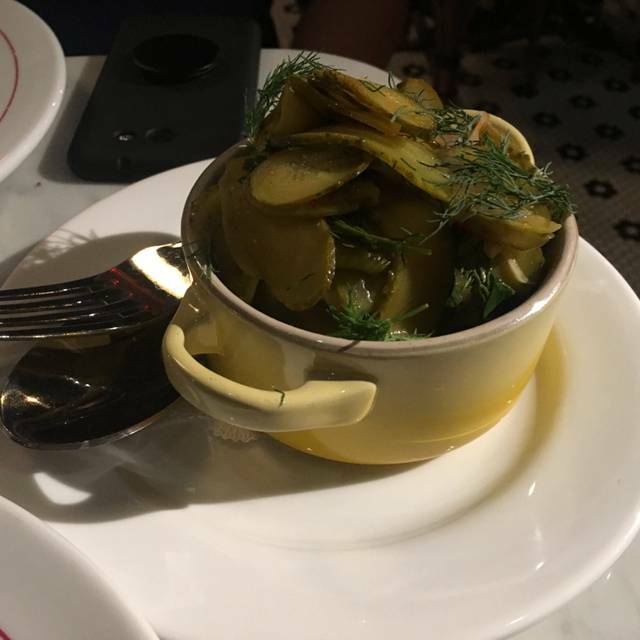 While the cocktails were good, the food is simply over priced for what it is. For example, paying $30 for branzino and nothing else is really ridiculous. It is also silly to pay $47 for lamb chops and nothing else. The lamb chops were simply okay. I have had better. While I don't mind paying a lot for a fabulous and creative meal, this is simply regular food at outrageous pricing. Only selected the restaurant because everything else near the Kodak theatre was booked on Oscar weekend. I see why it had availability. Starbuck's is next door. I have never left a restaurant and wanted to go to Starbucks. In fact, I rarely go to Starbucks except at the airport. After spending over $200 for dinner, Starbuck's coffee was the most memorable thing I had that night. For what we paid, the service was so far from what we were expecting. Within seconds of sitting down our server asked us if we knew yet what we wanted like we were in a diner. No one went over the various cuts or special menu items which made us feel rushed. My husband asked for help with the wine and the server asked what we wanted to spend and we said under $75. She then said all the cheaper wines were on the menu and took the book back making us feel like a couple of cheap-o's. We split a salad, the bread, a tomahawk and also had the mashed potatoes. 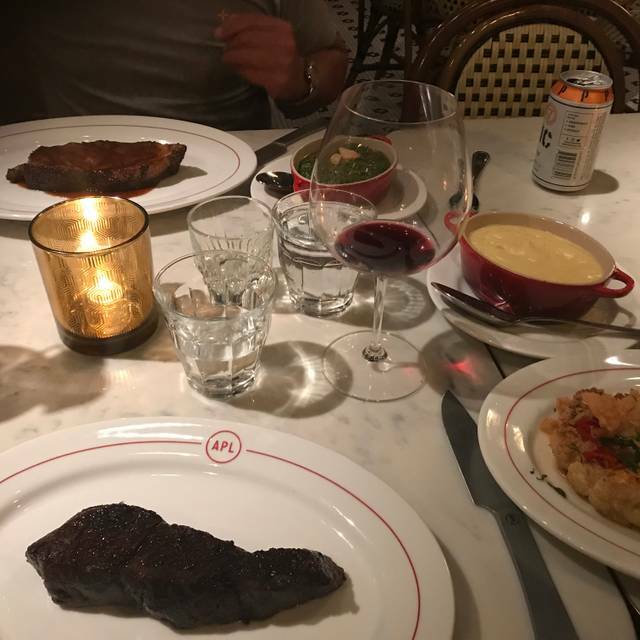 The food was truly delicious but at the end of the day we felt it wasn't worth it because there are plenty of delicious steak restaurants in LA that will not treat you like you are in the way. Really bummed. Great service from Ryan. The short rib steak was cooked perfectly. Food was fast and we made our show easily.